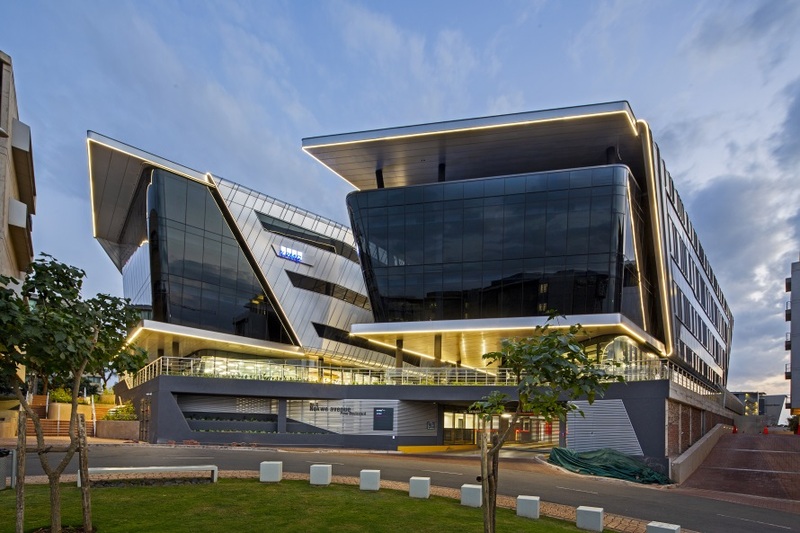 Shree Property Holdings, KPMG Durban, and Thusa, a local IT services provider. 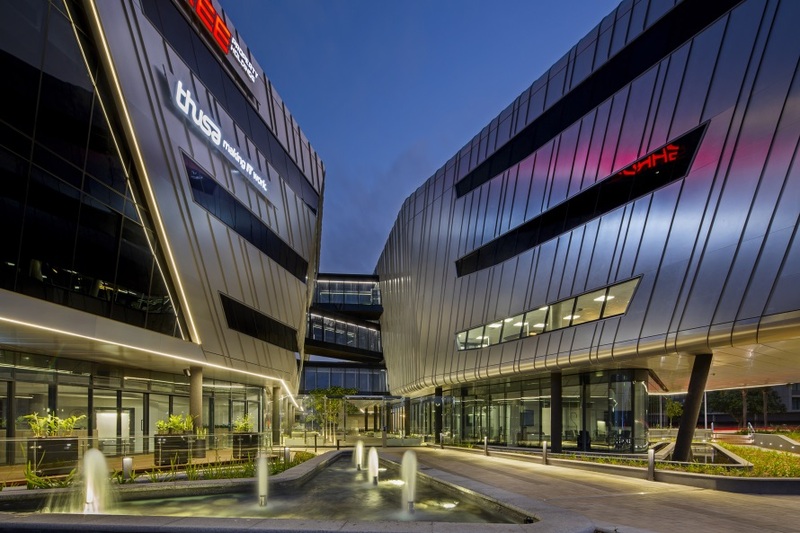 added to the Umhlanga skyline. 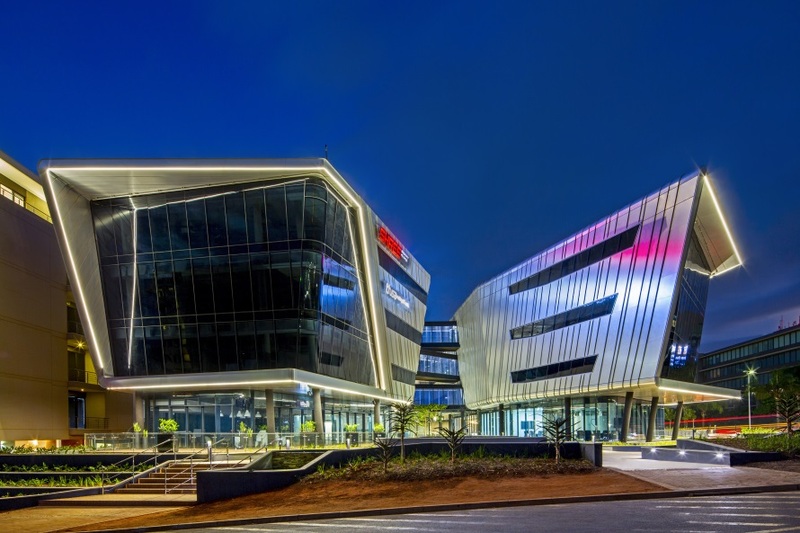 This iconic development is the end result of great teamwork between the Shreeprop team, Paragon Architects, and Regent Lighting Solutions(RLS) who contributed specialised and accent lighting requirements throughout. 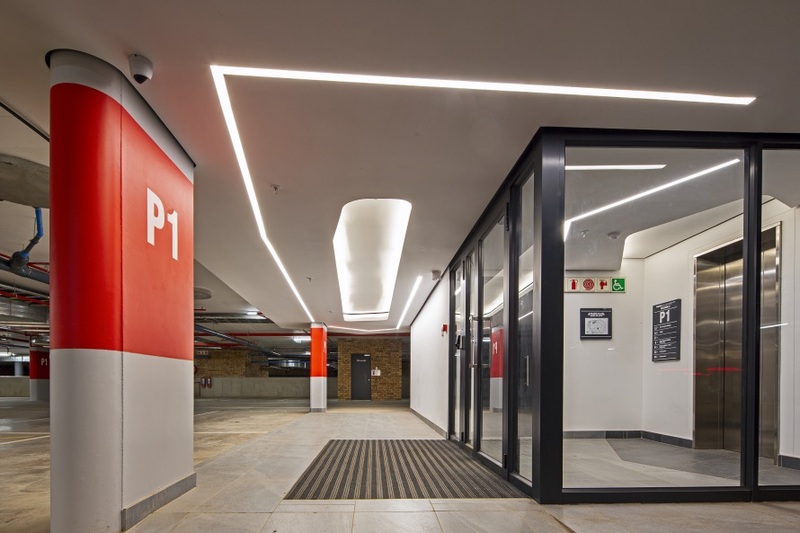 The lighting requirements were vast in that both interior commercial and architectural lighting solutions were specified for office interiors, canteens, and a coffee shop. The development has been specifically constructed in two separate buildings so as to be single or multi-tenanted. The construction lended itself to providing more natural light, and enables self-regulation of hot and humid climatic conditions. The open spaces between the buildings allow for social interaction, with a large overhanging cantilever providing shade for the outside eating spaces. 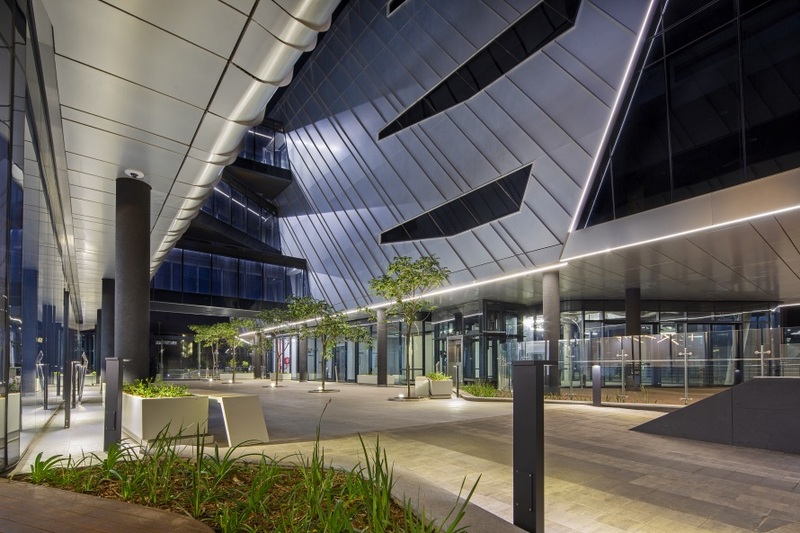 Exterior lighting solutions were key contributing elements that accentuate the façade of the buildings as well as the landscape features and pathways. 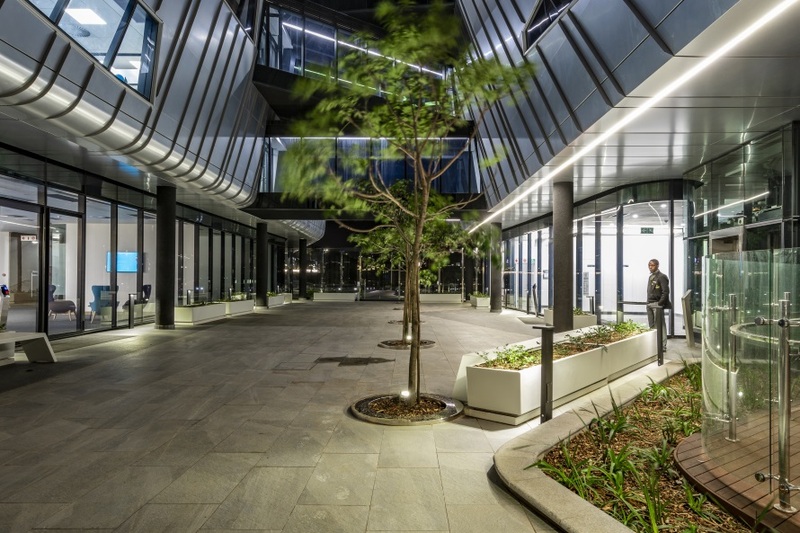 The featured products used on this project were the Miso recessed wall light 4000K used for footlighting on all the landscape planter walls as well as the exterior stairways and walkways. The Piazza Bollard 900mm 9W 4000k LED is plinth mounted in all pedestrian walkway areas. The bridge links are fitted with Mini Linear surface mounted luminaires at 24W/m LED 4000K. All lift lobbies are fitted with recessed ceiling linear mini 24W/m luminaires as well as LED Cove lighting above the overhangs.A new Linear ARC Channel of 27x27mm IP rated 4000K LED was specifically developed for the façade of the buildings in order to highlight and accentuate the architectural lines. The product is now known as the Arc. The investment in time and product development through our inhouse design capabilities have proven exceptional in that aluminium extrusions can now be tailored to the specific radial contours with the linear profile no longer having to be split at right angles in order to create a continuous flow of light. The design department spent countless man hours on development for the specific radii requirements on the Pran façade application. The special requirements had a minimum radii of 150mm that had to be achieved whereas the larger radii could be rolled. The unique aspect of the Arc is its ability to adapt its visual display in a 3-dimensional fashion. This is achieved by fabrication of the curves to provide its light source in three possible variations namely, downward facing, inward facing and outward facing all along the same continuous section. 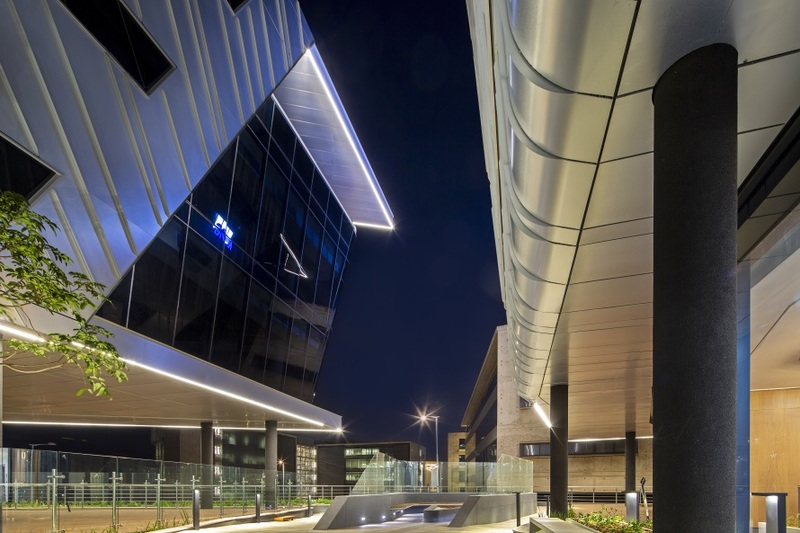 The Pran Boulevard application featured this 3-dimensional integration as lines of light are seen running up a wall, then under an overhang, then along the side of the building’s façade. 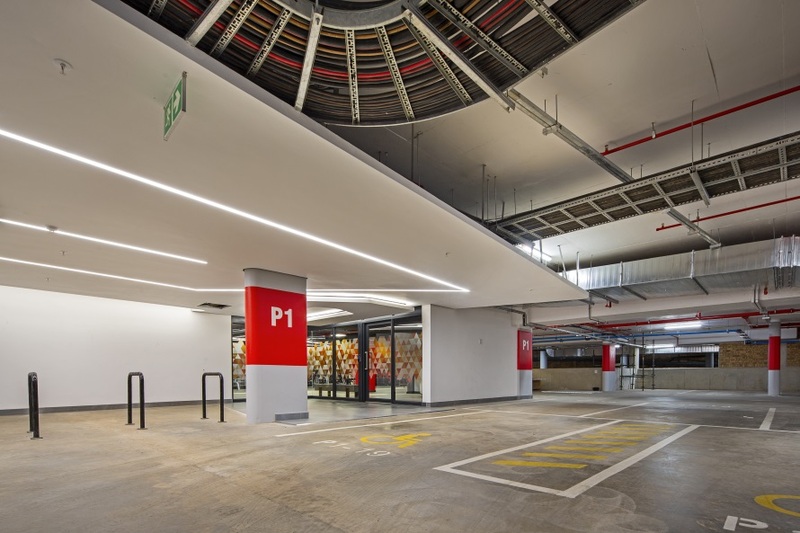 Curved sections are linked to straight sections creating seamless lines of continuous light.